John Monteverd researching supercell thunderstorms, May 2010. Karen Grove in the field. Jason Gurdak well sampling with students. Graduate students Forrest Horton, Bill Hassett, and John Sommerfeld planning geologic sampling of Himalayan granites, northwest India..
New iPhone/iPad app codeveloped by Toby Garfield tracks Bay Currents. A new study co-authored by Chair of the San Francisco State University Department of Earth & Climate Sciences and Associate Professor of Oceanography Petra Dekens shows how the structure of a large scientific meeting perpetuates the gender gap in science and points the way to strategies that might help make such gatherings more equitable. Women have been historically excluded from science — even in 1973, women held only 9 percent of the science and engineering Ph.D.s in American academia. Some disciplines have made progress in closing that gender gap, but there’s still a long way to go. For instance, women trainees still leave the geoscience field at a higher rate than men, Dekens says. “The gender balance in graduate programs has been close to fifty-fifty for a long time, and that isn’t being reflected in the mid-career stages,” she said. When Dekens decided to dig into the gender dynamics of her field, a conference was the natural place to start. These gatherings are where most of the networking in science happens, and they’re also where the biggest discoveries of the year are presented. She and several of her colleagues looked at data from the fall meetings of the American Geophysical Union (AGU) between 2014 and 2016. With over 24,000 attendees in 2017, the conference is the largest in the field of geoscience, bringing together researchers who study the Earth and space. They found that women had fewer opportunities than men to speak about their research findings. That’s because these opportunities were more often given to senior researchers, the career stage where gender disparities are the greatest. When men selected speakers, they tapped women only 29 percent of the time, even though women submitted 32 percent of the presentation abstracts overall. Women in a position to choose presenters, on the other hand, picked other women 37 percent of the time. The researchers published their results on April 24 in the prestigious journal Nature Communications. Here is the full article by Patrick Monahan SF State News and the paper published in Nature Communications and The Guardian article summmarizing and reporting on this research. Each year, each of the University's six academic colleges selects two students – one undergraduate and one graduate – for the honor of representing their fellow students during the ceremony by wearing their college's academic hood. This year Claudia Corona, receiving her MS in Geosciences, was chosen to be a recipient of a Graduate Hood. A high school field trip to Mono Lake – her first-ever camping trip – sparked Claudia Corona's interest in studying groundwater and sustainability. Already imbued with a high level of curiosity, she wanted to understand more about the place that provided much of the drinking water for her native city of Los Angeles. Growing up as the child of Mexican immigrants, she had learned to make the most of every opportunity, eventually earning a scholarship to Williams College in Massachusetts and then coming to SF State for graduate studies. Already the first in her family to earn a college degree, she will receive her MS in Geosciences at Commencement in May. At SF State, she worked on a project that was the first to demonstrate a relationship between climate variability and groundwater. She is also working on quantifying the influence of the subsurface on climate variability signals on their way to the water table. Outside the classroom, she volunteers with SF State's Sol Patch Garden, plays on the women's rugby team and volunteers with organizations that bring science into elementary school classrooms. She has also run both the San Francisco and Los Angeles marathons. After graduation, she will continue her SF State-based research before beginning doctoral studies, with a goal of becoming a water resource expert who can help California battle the drought and the impact of climate change on groundwater resources. We are happy to announce two new graduate fellowships in Earth & Climate Sciences. Both fellowships have similar goals and have the same yearly allocations of $10000. They are The Emerita Professor Karen Grove and Jay Ach Fellowship and The John A. and Anna Monteverdi Fellowship in Atmospheric and Climate Sciences. Both fellowships share a common goal--to provide a deserving graduate student with a sum that will substantially impact their ability to complete their graduate work given the financial constraints of the San Francisco Bay Area. On June 3, 2015, Profs. Karen Grove and Raymond Pestrong became Emeritus Professors after many years of dedicated service. At the same time, Profs. John Monteverdi and David Mustart entered the Early Retirement program, which means they will continue teaching half-time for another five years. On July 1, 2013, the Department's name will be changed from Geosciences to Earth & Climate Sciences. Chair Karen Grove announced the change at the Department's Alumni mixer on 31 May 2013. The name change is a first step in the revision of the Department's degree programs in order to take advantage of the interdisciplinary expertise of its faculty. Elzie Velasco was awarded the prestigious $10,000 ARCS Scholarship. The ARCS Foundation advances sciences and technology in the United States by providing financial awards to academically outstanding U.S. citizens studying to complete degrees in science, engineering, and medical research. Elzie's research explores the controls of interannual to multidecadal climate variability on groundwater levels and recharge rates in the Principal Aquifers of the United States. Results of her research are important because time-varying recharge rates can be used to greatly improve local to national-scale groundwater sustainability studies. Prof. Petra Dekens collaborated with A. V. Fedorov,	C. M. Brierley,	K. T. Lawrence,	Z. Liu, and A. C. Ravelo in a study just published in the journal Nature. The paper, entitled Patterns and Mechanisms of Early Pliocene Warmth, hypothesizes reasons why Pliocene sea-surface temperatures resembled those of today, yet atmospheric temperature patterns were different. The study, recently highlighted on the NSF "Where Discoveries Begin" web pages, shows that Cabon Dioxide concentrations were not the only culprits in the Pliocene warming, and that cloud feedbacks and ocean mixing played a significant role. A better understanding of what drove Pliocene climate, with its nearly uniform tropical ocean temperatures, will increase our confidence in the models being used to project climate change through the 21st century. In addition to NSF, the research was supported by the U.S. Department of Energy, the David and Lucile Packard Foundation and Yale University. After 22 years as a member of Geosciences Department faculty, Lisa started a new job in July 2012 as Director of Education at the UC Museum of Paleontology (UCMP) in Berkeley. Lisa says “the position allows me to be closer to my research roots in paleontology and be at the forefront of innovative projects to increase public understanding of the fossil record, evolution, the nature and process of science. In her new role Lisa is collaborating with educators and other museums to expand UCMP’s award-winning websites, Understanding Evolution (http://evolution.berkeley.edu/) and Understanding Science (http://undsci.berkeley.edu/), and leading the effort to develop a new web resource on Understanding Global Change for the K-16 education community, among many other duties! Bruce H. Davies, the Instructional Support Technician for the Department, has retired after 32 years of distinguished service to the Department of Geosciences. All of us, from the faculty, to the students and to the staff, bid him good luck in his retirement. On December 18, 2012, a celebration of Bruce's service was held in the Department's conference room. At that time, in a mixture of good feelings and sadness, Bruce was presented with the plaque pictured below. Besides the current faculty and staff, Emeritus Professors Charles Bickel and Ray Sullivan were in attendance, and Emeriti Ray Pestrong, Jon Galehouse and Steve Kirsch joined the festivities by phone. Bruce will be missed. Valerie Schwartz was awarded the prestigious $10,000 ARCS Scholarship. The ARCS Foundation advances science and technology in the United States by providing financial awards to academically outstanding U.S. citizens studying to complete degrees in science, engineering and medical research. The overarching goal of Valerie’s research project is to determine how the marine ecosystem off the California coast responded to globally warm conditions during the early Pliocene, the most recent time in Earth history when temperatures were warmer than today. Today, the California margin is characterized by relatively cool nutrient-rich water. During the early Pliocene California margin sea surface temperatures were 3-9°C warmer, yet productivity records and diatom assemblages indicate that upwelling still occurred. How did the ecosystem respond to such different conditions? Valerie will develop lab protocols to measure organic biomarkers in the marine sediments that will allow us to reconstruct the relative abundances of different phytoplankton. Valerie’s work will give us the first glimpse into the ecosystem response to warmer conditions in the California margin. The faculty of the Geosciences Department has voted to name Kelsey Kehoe the Thalmann Award recipient for 2012. This award, established in 1975 in honor of the late Professor Hans Thalmann, is presented annually to an outstanding graduating senior that has demonstrated academic excellence and high standards of human concern, as best embodied in the memory of Professor Thalmann. Kelsey will be presented with a certificate attesting to this award at the Department's post graduation reception this coming May 19th, right after the campus-wide commencement ceremonies. Toby Garfield, Director of the Romberg Tiburon Center for Environmental Studies and Professor of Oceanography in the Department of Geosciences, has announced a new iPhone and iPad application designed by researchers at SF State University. 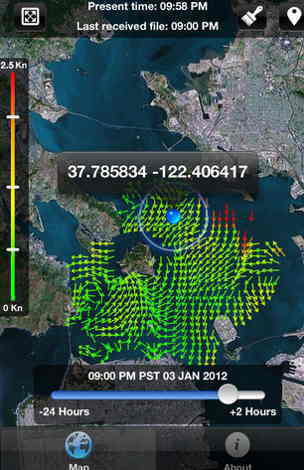 The app provides real-time and predicted information on surface currents within the San Francisco Bay. 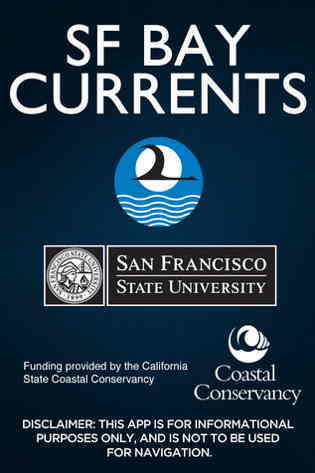 The app, called “Bay Currents,” relies on data supplied by the Coastal Ocean Currents Monitoring Program in Northern California (COCMP-NC), which monitors offshore currents and reports that information to the public. SF State is responsible for monitoring currents in the San Francisco Bay and along the coast from south of Point Reyes to Pillar Point near Half Moon Bay. Funding for the program was provided by the California Coastal Conservancy and operational funds are provided by U.S. Integrated Ocean Observing Systems Office (IOOS) that is administered by the National Oceanic and Atmospheric Administration. The app uses Google Maps and GPS to give sailors a real-time look at currents in the Bay, the previous 24 hours of currents and a projection for the next two hours. Users can locate their current location on the water using the GPS technology or place pins at points in the Bay to get an understanding of the currents at that location. The easily accessible information will help crews competing in the yacht races on the Bay,. The app is available for free through the iTunes iPhone/iPad App Store. Toby Garfield is co-developer of novel iPhone and iPad app called SF Bay Currents. Here are two screen shots. Kathryn Kynett was awarded the prestigious $10,000 ARCS Scholarship. The ARCS Foundation advances science and technology in the United States by providing financial awards to academically outstanding U.S. citizens studying to complete degrees in science, engineering and medical research. Kathryn's research focuses on better understanding the early Pliocene, the most recent time in earth history when temperatures were warmer than today. Her work will reconstruct density gradients in the upper ocean in the south Atlantic subtropical gyre and test the hypothesis that a deeper thermocline (the steep temperature gradient between the warm surface ocean and the cold deep ocean) during the early Pliocene contributed to warmer temperatures during that time. Michelle Newcomer was awarded a 2011 Graduate Student Research Grant from the Geological Society of America (GSA). The award will help support her research on recharge beneath rain gardens in coastal aquifers, including the Westside Basin aquifer in San Francisco. Congratulations to hydrogeology student Amber Kuss (MS, Geosciences) for winning the Physical and Mathematical Sciences category of the 2011 SFSU Student Research Competition. Amber will represent SFSU later this year in Fresno at the CSU-wide competition. The title of her talk was "Effects of climate variability on recharge in regional aquifers of the United States". Hydrogeology student Michelle Newcomer was awarded a 2011 G.A. Harris Research Instrumentation Fellowship from Decagon Devices. As part of her thesis, Michelle will use field instruments from the fellowship to quantify infiltration beneath rain gardens on the campus of SF State and subsequent recharge to the Westside Basin aquifer. Meteorology alum (Class of 2006) Austin Cross has accepted a forecaster position at the National Weather Service's (NWS) Forecast Office in Monterey. These positions have been far and few between and it is quite a coup for Austin to achieve this position, especially since posts at this office are widely sought by meteorology graduates across the country. Austin joins MS Geosciences candidate Chris Stumpf who is also working at this office in an SCEP position (News item for April 2010). Hydrogeology student and NASA Ames DEVELOP team member Michelle Newcomer (MS Geosciences) is quoted in NASA Ames news article: NASA Ames Scientists Train the Next Generation of Earth Explorers. "I heard about the internship program while attending San Francisco State University, said Michelle Newcomer. "I applied because it sounded really exciting. I wanted to apply my geographic information system (GIS) and remote sensing skills to real-world projects." Andrew Oliphant, from Geography and Human Environmental Studies (as Principal Investigator), John Monteverdi (as co-Principal Investigator) and colleagues from SJSU received a NSF Major Research Instrumentation grant (~$700,000) in May, 2010 to develop a mobile atmospheric profiling system (CSU-MAPS) for use in a wide range of research and educational goals. The mobile system is comprised of a 20’ trailer with a 100’ extendable tower equipped with five levels of micrometeorological instruments, a Halo scanning lidar system which measures three-dimensional wind speeds up to 5 km along with aerosol concentrations and cloud level detection, a Radiometrics microwave profiler which measures temperature and humidity also in the lowest 5 km. CSU-MAPS will be towed on-site and deployed within about an hour by two people. There is also a Vaisala meteorological balloon sounding system which will be used to validate the remote sensing instruments. CSU-MAPS will be used in a wide range of collaborative research projects including severe thunderstorm observations, urban micrometeorology, wildfire meteorology, alpine meadow and wetland water and carbon fluxes and alpine valley atmospheric structure and airflow. The system will also have numerous applications in undergraduate and graduate level education in five departments on three CSU campuses as well as K-12 science outreach. John Sommerfeld was awarded a 2010 Graduate Student Research Grant from the Geological Society of America and received an Outstanding Mention for his grant proposal for exceptionally high merit in conception and presentation. John will participate in a formal recognition ceremony at the 2010 GSA Annual Meeting in Denver, CO.
Chris Stumpf, working on his MS in Geosciences under John Monteverdi's mentorship, has each been awarded a 2010-2011 Student Career Experience Program (SCEP) internship from the National Weather Service (NWS) office in Monterey. About 60 SCEP internships were awarded nationally. The highly competitive SCEP internship gives meteorology students valuable work experience at an NWS forecast office under the guidance and direction of their university. Students complete at least 640 hours of hands-on career-related work including forecasting, research and outreach activities. Upon successful completion of the required work hours and graduation, the SCEP student is offered a full-time position at the NWS on a non-competitive basis. In short, this internship leads to a full time career position with the NWS. Forrest Horton has been awarded a 2010 National Science Foundation Graduate Research Fellowship. This prestigious 3-year award recognizes and supports outstanding graduate students in NSF-supported science, technology, engineering, and mathematics disciplines who are pursuing research-based master's and doctoral degrees in the U.S. and abroad. The first year of this award will support Forrest's current research in the Indian Himalaya and continue to support his research efforts in a PhD program starting Fall 2011. Isaac Jones has just been notified that he has received a Nortek 2010 Student Equipment Grant. The award consists of the loan of an acoustic doppler profiler instrument (Aquadopp Profiler). 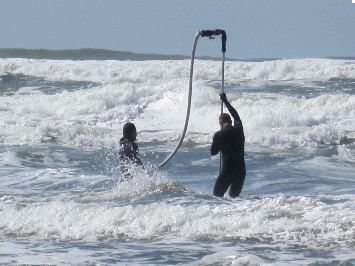 Isaac is currently out on Ocean Beach collecting data with this instrument as part of his thesis research. Isaac (and Jeff Hansen) jetting a pipe in the bed. 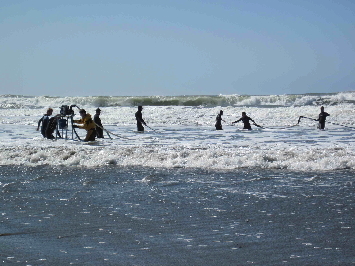 Research crew in the surf zone. Karen Grove, Dave Dempsey and Petra Dekens were informed that their proposal to the NSF's Curriculum and Laboratory Improvement (CCLI) prgram was approved. The project timeline and amount: 3/1/2010–8/31/2012; $175,000. The Principal Investigators (Grove, Dempsey, Dekens) will work with Graduate Teaching Assistants to create exciting new laboratory activities for the introductory geology, meteorology and oceanography classes that undergraduate students take to fulfill their physical science requirement for general education. They will also create a Teaching and Learning Community (TLC) to provide a venue for exploring innovative pedagogical methods and for better linking the laboratory and lecture components of the courses. Funds are provided to hire students to help with the project and to purchase new computers to renovate a standard departmental room into a state-of-the-art teaching and learning classroom. The SF-ROCKS program (Reaching Out to Communities and Kids with Science in San Francisco) is expanding beyond the Bay Area with a new National Science Foundation grant! The goal of the new program, METALS (Minority Education Through Traveling and Learning in the Sciences), is to create meaningful geoscience experiences for high school students through experiential learning in National Park field settings. METALS evolved, under the direction of Lisa White, from a strategic alliance between SF-ROCKS and geoscience diversity programs at the University of New Orleans, the University of Texas at El Paso, and Purdue University. The collaboration will provide multi-year experiences for high school students (grades 9-12) from urban and rural areas who are underrepresented in the geosciences, including African Americans, Hispanic Americans, Native Americans, and Native Pacific Islanders. The project plan and activities include instructional field trips for 40 high school students selected from each of the four university areas. The field trips, to different National Park regions each year, will explore California and the Pacific Coast, the Colorado Plateau and Southwest, the northern Rocky Mountains and Great Plains, and the Gulf Coast. Professors and graduate students from each university will lead field seminars designed to connect underrepresented students with a deeper understanding of how Earth science processes impact local communities, and how place-based understanding of landscapes varies among cultures. The 4-year NSF collaborative award to San Francisco State, University of New Orleans, University of Texas at El Paso, and Purdue University totals $1,499,967. Professor of Geology, member of our faculty, and UC Santa Cruz graduate alumna, Lisa D. White delivered the keynote address (Providing inspiration and changing lives through collaborations in science) at UC Santa Cruz’s 43rd Graduate Commencement ceremony on Friday, June 12, 2009. Lisa is currently the Associate Dean of the College of Science and Engineering as well as Professor of Geology at San Francisco State University. Lisa continues to actively contribute to the department by teaching Earth and Life Through Time and Graduate Seminar in Geoscience. Throughout her 20-year faculty and administrative career with us, Lisa has been active in efforts to increase diversity in the Earth sciences. She is the director of San Francisco State’s SF-ROCKS (Reaching Out to Communities and Kids with Science in San Francisco), an NSF and NOAA funded project founded in 2001that engages public high school students in the Bay Area. SF-ROCKS has allows students to gain hands-on experiences in Earth and Environmental Sciences through research projects and training. In October 2008 Lisa was named as the inaugural recipient of the Geological Society of America's Bromery Award for Minorities, an honor bestowed upon a geoscientist who demonstrates the commitment and drive to help minorities achieve success while maintaining a strong record of research and service to the geologic community..
Graduate students Erika Amir, William Hassett, and Deborah Shulman have been awarded Research Grants by the Geological Society of America for 2009. Erika Amir was awarded $3,750 to complete her field work in Death Valley and U-Th/He thermochronology to study the Plio-Pliestocene exhumational history of the Black Mountains. William Hassett was awarded $2,890 to support field work in the Indian Himalaya and complete Nd and Pb isotopic analyses on Miocene granites collected there. Deborah Shulman was awarded $2,690 to support field work in the Lofoten Islands of northern Norway to study deformation and metamorphism in lower crustal rocks including using EBSD on the College of Science and Engineering's new scanning electron microscope. The Bromery Award recognizes the outstanding education and service contributions and commitment to the advancement of minorities that characterized Bill Bromery’s career. No person is more appropriate to receive the first Bromery Award than Dr. Lisa White, who has demonstrated the same commitment and drive to help minorities achieve success while maintaining a strong record of research and service to the geologic community. Mary Leech, along with Co-PIs: A. Ichimura, B. Manning, W. Denetclaw, K.-S. Teh, has received a major research instrumentation grant from the NSF totalling $783,210. The grant will be used to purchase a high-resolution scanning electron microscope with EDS, EBSD, STEM, and CL capabilities. Mary and her co-PIs anticipate the SEM will be installed and ready for use in mid-2009, greatly expanding faculty and student research opportunities in Geosciences, Chemistry, Biology, Physics and Engineering. For more information, see http://www.nsf.gov/awardsearch/showAward.do?AwardNumber=0821619. Petra Dekens has been awarded an NSF grant for $230,808. She'll be reconstructing a 5 million year record of sea surface temperatures and subsurface conditions in a site in the south Atlantic subtropical gyre. The work will address questions about the link between the subtropical gyres and the tropical oceans through the ventilated thermocline, and the role that changes in that link played in the transition from globally warm condition of the Pliocene to the much colder Pleistocene. John Monteverdi posts a Blog of his field research each year. His research has led to over ten publications in the referreed literature, including several with his students. Here's a link to his blog/diary from the trip in May and June of 2008. In 2006 Karen spent 6 months living in Chile as a Fulbright Scholar. She worked in the geology department at the Universidad de Chile in Santiago and was also able to travel throughout the country. For geologists, it's an amazing place and she wanted to share it with students from San Francisco State. Karen was "jjazzed" that 18 SFSUers decided to accompany her to South America to explore the Andes. Here's the website that documents this successful student expedition into the Andean Cordillera.